Thirty-two essays by leading writers in the field present a rich and varied series of views of a still little known medium, enlivened by over 280 illustrations. 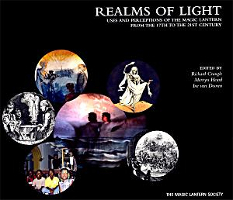 Realms of Light is organised in four interrelated and overlapping sections, covering the main areas of lantern use, its applications in different cultures, examples of particular use and, finally, the lantern’s continued influence after the exaggerated reports of its ‘death’ at the end of the nineteenth century. This is an exploration of a fascinating history, but one which emphasises the lantern as a living medium that still plays a role in the culture of today.